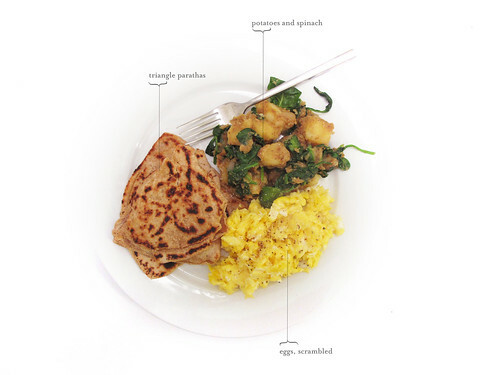 A few nights ago I was craving breakfast for dinner but I was also craving Indian food – so I combined the two and came up with this meal. 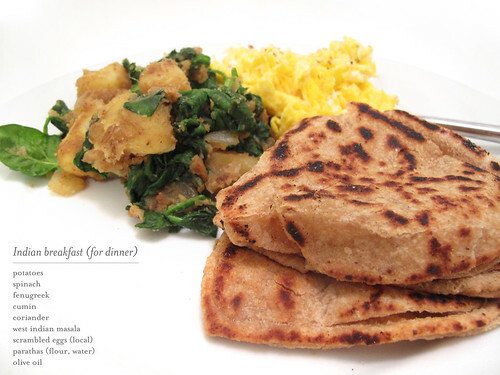 The parathas were the shining star of this meal. I’ve been attempting various Indian quick breads for a while now and this has been the most successful batch I’ve made. I was inspired by a recipe I found at Holy Cow! Vegan (one of my favorite food blogs) but found the recipe here super helpful. I made the potatoes by cubing a boiling .5″ – 1″ chunks of potato until soft. Then I heated some oil in a pan and added the potatoes and spices to that – I found the spices were clumping so I added a bit of water to the pan to get them to disperse a little – the water boiled off and when the potatoes were browned a little I added a bag of spinach to the mix and turned off the heat. And yes, I get the irony that I’ve linked two vegan blogs in a food post that also features eggs. As of right now I’ve cut way back on dairy and for whatever reason I’m not as disturbed by (local) eggs. I’m usually an all or nothing kind of gal but I’ve found being more moderate in my part-time vegan approach to work for me. But more on that later!